We are not just experts in natural stone and tile. At Classic Marble Restore, we can also help you change the look of your concrete floors as well! We can grind your floor to remove unsightly trowel marks or to expose the granite pebbles and rocks just beneath the surface. Polishing will last years versus a topically coated floor. 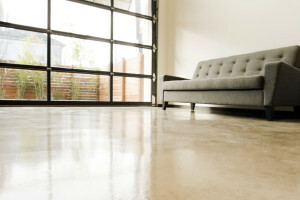 If you own a home or a commercial, retail, or industrial property with polished concrete floors, you're probably very familiar with the time and effort that goes into maintenance — coating, stripping, recoating, stripping again... and so on. Unlike concrete covered with waxes or coatings that become scratched and trap dirt, our concrete restoration processes give your concrete a natural polish. By getting rid of the coatings once and for all, your concrete will no longer peel or flake and will be much easier to maintain. With our concrete polishing services, you can do away with the stripping and waxing altogether and save yourself a lot of time, effort, and money. If your concrete has become dingy, scratched, stained, or just dirty looking, we can help. Regular cleaning and janitorial services are valuable for simple, day-to-day care of concrete floors. But over time, their processes leave floors with shiny scratches and increasingly obvious traffic patterns. As these problems develop, you become more and more dissatisfied with the appearance of the floors until it’s time for another round of professional restoration. With our regularly scheduled maintenance program, your floors can look great all the time, without the need for periodic restoration. Applied over epoxy coatings, our New Generation Coating application improves slip resistance, light reflectivity and adds protection to the surface. This treatment offers an excellent, cost effective alternative that provides a hard, durable and chemically resistant floor covering that is easily applied over concrete or other existing worn coatings. To learn more, visit our Specialty Solutions page. Do you need concrete polishing or concrete restoration services in the Philadelphia and Delaware Valley area? Use our online contact form or call at (610) 356-4100 today for a FREE estimate.